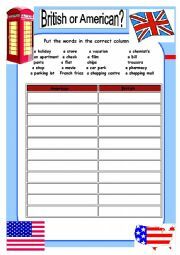 An activity to review the past simple or the adjectives . Identify words which are either English or American. 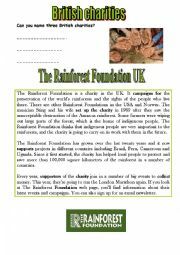 An activity based on a text about the rainforest foundation. infinitive of purpose things to do before going on holiday. An easy way to review the infinitive of purpose. You can also review places and things you need to go to and do before leaving on holiday. 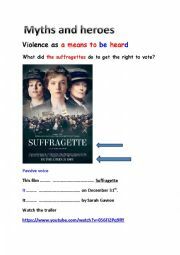 A way to use the trailer for the film the suffragettes. Both a listening comprehension tasks and oral presentation. How to present this topic of getting the right to vote in England. Hope it will be useful. An excellent idea to make your students talk by guessing, inventing possibilities in a crime. You�ll give them information step by step , forcing them to anticipate and reformulate their ideas. Good way to use the past modal verbs. Have fun with it. 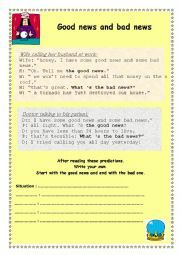 A reading activity based on two short jokes. You�ll have to make your students write another one. 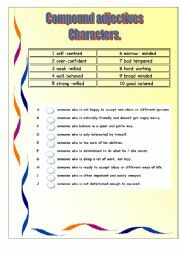 An activity to learn some compound adjectives. 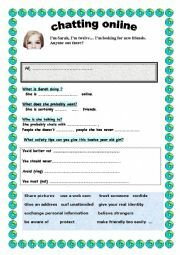 A great poster to use in class to make your student talk about the danger of chatting online. Very efficient . 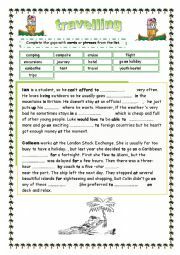 You�ll find the poster (for a transparency) on the worksheet called the mask. A comic strip with the soundtrack, a fun activity to review simple past and present perfect. Listen and fill in the gaps. Are you a good detective? Read and find clues to arrest the pickpocket. a different way to check if they can make questions in the past. a short quiz to review simple past using James Bond.